Our mascot of Steam Bunny from Steamzine has her story featured in a new steampunk anthology book from Kerlak Publishing titled Gadgets: Dreams Of Steam III It's available in print and on Kindle. T.E.D. : Terran Extermination Droid by John Powell continues in a new weird west/steampunk tale, T.E.D. 1840: Time Exploration Droid. 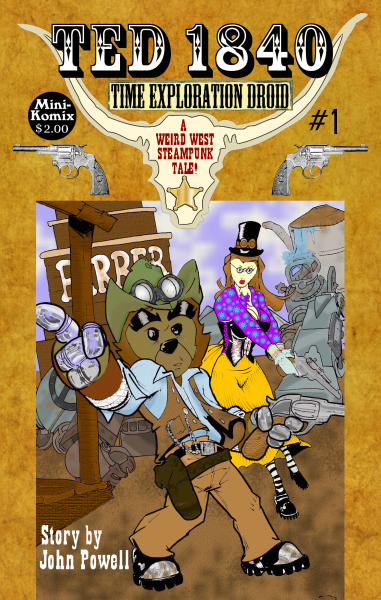 The robotic spacebound teddy bear from the future comes back into time to the Old West to find his nemesis Megacog as history is being altered with new clockwork technology. Fans of The Wild Wild West(the TV show, not the movie! )should have a rip-roarin' time. We've got this available in print through us, as well online. You can download it from Drive Thru Comics and Lulu. We'll have a table at the first ever Warner Robins Comic Con is set for Feb. 17 at the Comfort Inn & Suites on 95 GA. Hwy. 247 S., Warner Robins, GA. 31008. We'll be at the next Atlanta Comic Convention on Feb. 3 at the Marriott Century Center on 2000 Century Blvd., GA. Atlanta, 30084.